The Winter Olympics will be the most advanced games ever in terms of technology employed. New measures include high-speed trains, WiFi on flights, 4G connectivity in many locations and better facilities for the handicapped. It is hard to think of an event that would compare to the modern Olympic Games in terms of scale and organization. Russia's biggest companies are doing their best to ensure that guests of the 2014 Winter Olympics will have no difficulty getting to Sochi by air and over land — and all while remaining constantly connected to the Web. Most athletes and guests will fly into Sochi. Aeroflot's 2013–14 winter schedule features five daily flights between Moscow and Sochi; if necessary, this figure can be increased to 12. In addition, between Jan. 27 and Feb. 25, Aeroflot will be operating a daily service between Sochi and Frankfurt-am-Main with Airbus A321 narrowbody airliners. The Sochi Olympics will be the most advanced games ever in terms of technology employed. Aeroflot passengers will be able to appreciate Wi-Fi Internet access on some of the flights into and out of Sochi. Russian Railways is building the key transport route of the Sochi games — a combined automobile and railway line between Adler and the Alpica-Service mountain health resort. From the resort, it will be possible to get to the Sanki Sliding Center and other Olympic facilities. The line stretches for 30 miles, passing through 12 tunnels and over 46 bridges. The combined length of roads built for the project exceeds 80 miles. Another new railway line will connects central Sochi and the local airport. More than 50 percent of all air passengers arriving for the Games will use railway transport to get to the city. Estimated travel time will be under one hour. 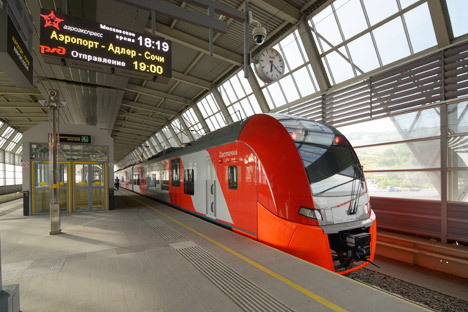 This is the fifth such air-rail service to be launched in Russia after Moscow, Yekaterinburg, Vladivostok and Kazan. The line will be served by Lastochka trains. This new type of electric locomotive, based on the Siemens Desiro design, has been developed for commuter transportation in the Russian environment. It can operate in outside air temperatures between -40 and 104 degrees Fahrenheit, under humid and icing conditions. Furthermore, the Sochi Lastochkas will be the first trains in Russia to have wheelchair lifts fitted. In fact, all Russian Railways facilities in Sochi have been built or retrofitted to accommodate disabled passengers. Measures include special aural visual annunciation and Braille signage on signposts and timetables, as well as dedicated ticket counters, wheelchair ramps, lounge areas and lavatories for the disabled. Special care has been taken to ensure uninterrupted cell phone and Internet connectivity at peak times. Russian mobile phone operator MegaFon is working to expand and improve Sochi's telecom infrastructure with over 700 new 2G/3G/4G cell towers. Sochi 2014 will be the first Olympic Games to offer 4G connectivity at a speed of 10 MB/sec. Subscribers to other operators will be able to access MegaFon roaming services through the settings menu of their mobile devices. The entire Olympics transportation and telecom infrastructure will be preserved in and around Sochi after the Games, turning this resort area into one of the most technologically advanced and developed regions in Russia. Many of the innovations first tested in Sochi will then be implemented elsewhere across the country.